There are some phishing attacks going on currently that leads to hacks of Gmail accounts, and Google has been notified about this and started rolling out new update for Gmail users on Android. This update let you keeps your email safer from phishing attacks. When you click on a suspicious link in a mail, Gmail will show a warning prompt helping you keep your account safe. Like the one in the image above. We just have to be careful of the kind of links we click in a mail that we are not sure who the sender is. This also applies to attachments we download in a mail. Hackers can be trickish. Stay safe guys. 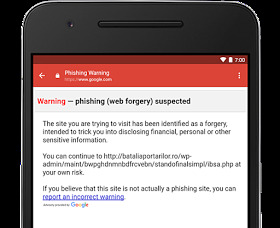 Gmail for Android gets Anti phishing security update. Download Gmail for Android apk. Gmail anti phishing security update. Very good from them.. but why kachi why my gmail account login in two different place? I don't understand. Which place? I love this. Always staying ahead. Nice one Google Inc. I still don't know the cause of that. Will sort it out soon.